Last week, a man crash landed his drone on the White House lawn. Evidently, the individual, a member of a US intelligence agency, had been drinking and was showing off his drone to a friend when he lost control of the craft. DJI Phantom drone with a GoPro camera. Any other house and lawn and no problem. Obviously, not the case here. The president called for more drone regulations. Headlines fretted White House security. 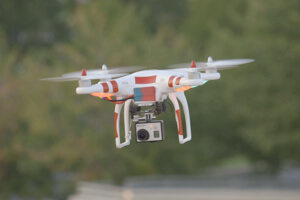 And DJI, the drone’s maker, grounded drones in the Washington DC area with a GPS software patch. Now, it’s not to say DJI’s move doesn’t make sense. The fledgling drone industry is just getting its feet, and the FAA is still considering how to regulate it. Bad press about runaway drones in high-security areas? Not really all that ideal. Also, since 9/11, the airspace around Washington DC has been highly restricted. It’s not hard to see why the rule make sense in Washington. If a drone can carry a camera, it can carry more lethal packages and deliver them at a distance. DJI had also already established a few thousand no-fly zones surrounding airports. Such no-fly zones are as much about safety as malevolent acts—mistakes happen, and we wouldn’t want a jet engine inhaling an errant toy aircraft. But underneath all that is the fact that a simple software update can dramatically change what an already owned product can do. Most updates add functionality, but in this case an update took functionality away. Where most regulated products rely on the threat of punishment and law enforcement to ensure people follow rules, with computer-based physical products, we may be witnessing the birth of a new, distinctly modern regulatory era. Imagine a future in which the FAA rules on a particular item—say, no drones within 100 feet of federal buildings. Prior regulations have been put in place that require all drone makers to update their no-fly zones within five days. Almost instantly, no drone can fly within some new set of GPS coordinates. Why might this be appealing to regulators? In theory, the rule requires less enforcement because drones are physically prevented from flaunting it. We’ve been talking drones, but they’re just one early example. There are others. 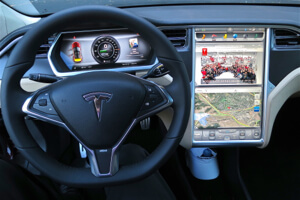 Tesla, for example, is well-known for pushing automatic software updates to its cars. And these aren’t just updates to the dashboard readout. Elon Musk just announced a software tweak to improve the Tesla Model S P85D’s acceleration by 0.01 seconds—small but significant in the high-end market where accelerations are measured and compared in hundredths of seconds. As we head toward an increasingly driverless future, cars will become more like computers on wheels than wheels with computers. What regulations could be written into software? Speed limits? No-drive zones? Car won’t start until you put on your seatbelt? And, of course, it doesn’t end there either. Analysts expect billions of new physical devices to come online in the next decade. The Internet of Things may afford the government real-time regulatory enforcement—government mandated thermostat settings to save energy or restricted water usage in a drought, for example. Could such a system be abused? No doubt about it. Well-meaning regulations with unforeseen consequences are written regularly. Authoritarian regimes that already keep a tight grip on their countries’ internet could, in the future, control much more. Further, regulatory software updates would likely only work for the law-abiding—those motivated to circumvent them will find a way. But so it is with any technology. It’s trite but true—technology is a double-edged sword. The ability to wirelessly update a product may also extend its life and slow obsolescence. Your Tesla might get faster or smoother acceleration. Your drone may become a better flier in high winds or learn to do a flip off the palm of your hand. What do you think? How does ownership change when the maker of a product can modify it at will? Is regulatory enforcement at a distance a good thing? Or does it herald an era of stifling control? A little of each perhaps?